You’ve spent a lovely warm summer in your garden using your wooden furniture. But as the long summer now draws to a close, we look ahead to the colder months to see a wet and freezing winter on the horizon. Even though most durable wooden furniture is designed to be left outside over the winter, a little seasonal maintenance now is key to prolonging its life and keeping it looking like new. 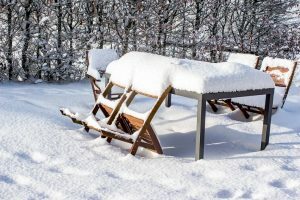 Here, we offer a guide on how to prepare your wooden garden furniture, fencing, sheds and decking for the winter. Nelson Potter supplies a range of wood treatment and protection products, as well as high-quality timber fencing, garden sheds and wooden garden furniture for customers in East Anglia, including Suffolk, Norfolk and Cambridgeshire. Both horizontal and vertical wooden surfaces suffer in winter, but horizontal surfaces (such as benches, tables and decking) tend to need a little more maintenance and protection than vertical surfaces (such as fences) because they are staring directly up at the elements. Choose a nice, sunny day with a light wind to begin your outdoor winter prep. If your wooden garden furniture has become dirty or greasy over the summer, give it a good wipe down with some warm, soapy water and a cloth and rinse it with cold water. Alternatively, if there are no dirty spots from summer use, just give the whole thing a going-over with a medium-to-soft-bristled brush to remove any garden debris, such as leaves, cobwebs, bird droppings, lichens and dust. Dirt and debris hold moisture far better than clean surfaces – and it’s moisture that begins the decaying process. It’s essential to let any wooden products dry thoroughly in the sun before applying any treatment products. Wood protection and treatment products will only penetrate the wood if it’s clean and completely dry. There is a huge choice of wood protection and treatment products on the market and Nelson Potter stocks a range of the highest quality. Each of our wood protection and treatment ranges come in a variety of colours to perfectly complement their surrounds or to match the wood’s existing colour. As well as your personal taste, your choice of treatment product should reflect the type of wood you are treating as well as its function. You might use a brighter, contemporary shade to give your garden a boost of colour or use a natural tone to enhance the wood’s natural beauty. With a little preparation now while it’s still warm(ish! ), you can avoid your wooden garden furniture, decking or fencing rotting or deteriorating with the cold and wet weather that winter brings. Nelson Potter stocks a range of wood protection and treatment products designed to prolong the life of your wooden garden furniture in Suffolk, Norfolk, Cambridgeshire and the rest of East Anglia. Click here to see our range of wood treatment products and application brushes.